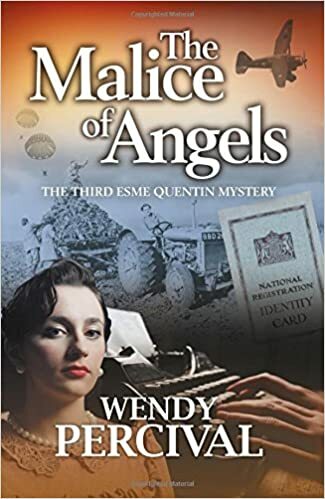 I’m a keen family historian and the author of the Esme Quentin genealogy mysteries, a series inspired by the fascinating secrets I’ve unearthed during my own family history research. I live in a beautiful little village in the middle of Devon, having moved to the area 38 years ago to take up a teaching post in a small rural primary school. My books are set on the rugged North Devon coast, close to where I used to teach. It began a few years ago with a local news item about the death of a woman in Torquay. Her neighbours only knew her slightly, as she was a very private person. But it emerged in the weeks following her death that she’d been one of WW2’s heroines, a Special Operations Executive, serving under cover in occupied France. I went on to read both her biography and those of other SOEs. As I read about their incredible experiences, the story grew from there. It means a lot! It’s always a huge reward (and sense of relief!) to know a book has been received well, after all the blood, sweat and tears which go into writing it. I’ve written 3 novels and a novella, all featuring my protagonist, historical researcher/genealogist, Esme Quentin. In my first novel Blood-Tied, (set in Shropshire, where my own ancestral research began) Esme’s sister Elizabeth is left unconscious following an apparent unmotivated attack. Two days later Esme discovers Elizabeth has a secret past. Esme is convinced the attack is connected and resolves to uncover the truth, unaware of the dangers ahead. Readers really took to Esme and wanted to know when they could read more about her, so I took the hint and wrote, The Indelible Stain, which became the second of the series and was awarded an IndieBRAG medallion. This time Esme is on a sabbatical in Devon and catching up with old friends. As she arrives she stumbles upon a fatally injured woman on a beach who’s clearly fallen from the cliffs above. Although the police write the incident off as accidental, Esme is unconvinced and her subsequent search for answers takes her back to the horrors of convict transportation to Australia in the 19th century. My novella, Death of a Cuckoo, was published by SilverWood Books under their “short reads” imprint, sBooks. The story is partially set in a village on Exmoor and is told from the POV of Gina Vincent who stumbles upon a shocking anomaly about her own past. Gina employs Esme Quentin to help her search for the truth. I’ve a plot brewing in my head at the moment which may very well be turn out to be the next Esme story. But that’s all I’m saying at the moment – I’m superstitious like that! If it’s “indoor” weather, I’m usually researching my family history or doing something associated with that, such as scanning in old photographs or writing about what I’ve found. Over the past four years I’ve written a blog about some of the things I’ve discovered about my family and my husband’s family, which have ranged from fascinating, to shocking, to desperately sad. It’s a fabulous way to learn social history. I love it! As a complete contrast, I’ve recently been learning to play the ukulele. Someone in the village has played for a few years and she formed a group for anyone who fancied having a go. We meet up every two weeks to strum along together. It’s great fun! If the weather’s fine, I’ll be outside gardening or we’ll head off somewhere in our campervan, often somewhere on the South West Coast, and walk the coastal footpaths. We’re so lucky to have so many beautiful places to visit within a relatively short distance. The village runs its fair share of fund raising events, with which everyone helps out. We have a gem of a parish hall – it’s old, thatched and was once a barn. In recent years we’ve raised a considerable amount of money to have it completely renovated and as we don’t have a village pub any longer (closed down in 1947!) it’s become the main ‘social hub’ where everyone living in the village and surrounding area can all come together. I’ve been a long-time fan of Robert Goddard, described as “the master of the triple double twist”, particularly his earlier books. He has the ability to confound the reader every time! Elizabeth George is another author whose early novels I’ve enjoyed. I read her book Write Away (subtitled One novelist’s approach to writing fiction and the writing life) when I first started out which was incredibly helpful. When Blood-Tied was first published by Hale, back in 2008, I wrote to her to tell her so, too, and she wrote back to congratulate me! In the past I used to read a lot of Catherine Cookson novels. Susan Howatch was another favourite, along with Daphne du Maurier and Joanna Trollope. More recently I’ve enjoyed Sharon Bolton’s Lacy Flint novels and CJ Sansom’s Shardlake books. I think it stems back to one of my favourite children’s books of all time, The Secret Garden, which my mum used to read to me. I loved the mystery of the crying in the night, the hidden garden door and Mary making it her business to find out what was going on. I was an Enid Blyton Famous Five fan, too. When I began doing family history – which is a sort of digging around, uncovering mysteries and revealing secrets – it seemed a natural progression to write in the mystery genre with a genealogical twist. When I first began writing Blood-Tied, genealogy mystery fiction as a category didn’t exist but with the popularity of Who Do You Think You Are? it’s become a blossoming sub-genre which is brilliant. I often say that to write the books I do, I have to plot 2 stories. The first is what happened in the past which has now impacted on the present to create the “inciting” event at the start of the Esme book I’m about to write. That will be quite detailed, and includes the characters and how they’re affected by the situation. The second plot is of the book itself, how Esme unravels the truth, how someone will try and stop her, and how matters are resolved. So if I wrote that first plot as a book in its own right, it would be a piece of historical fiction. If I continued it on, linear style, into the present day, it might even develop into a saga! Normal. I have to get up and “start the day” first or I can’t concentrate! And finally, … What is your favourite book of all time? Oh, what a question! How can anyone answer that? Oddly enough I lent a book to a friend the other day, and as I gave it to her I told her it was one of my all-time favourites, as it’s always stuck in my mind and it must be over 40 years since I first read it. So perhaps I’ll cite that one. It’s called The Round Tower by Catherine Cookson. Wendy Percival was born in the West Midlands and brought up in the Worcestershire countryside. After training as a primary school teacher she moved to North Devon in 1980 to take up her first teaching post and remained in teaching for twenty years. An impulse buy of ‘Writing Magazine’ inspired her to start writing seriously. She won ‘Writing Magazine’s Summer Ghost Story competition in 2002 and had a short story published in ‘The People’s Friend’ before focusing on full-length fiction. The time honoured ‘box of old documents in the attic’ stirred her interest in genealogy and became the inspiration for the Esme Quentin Mysteries – ‘Blood-Tied’, ‘The Indelible Stain’, for which she received the indieBRAG medallion (Book Readers Appreciation Group), and a novella, ‘Death of a Cuckoo’. When she’s not writing fiction, Wendy conducts her own family history research, sharing her finds on her blog, www.familyhistorysecrets.blogspot.com. She’s also had articles published in Shropshire ‘Family History Society’s quarterly journal and in ‘Family Tree magazine’. Wendy lives in a thatched cottage beside a thirteenth-century church with her husband and a particularly talkative cat. You can find more on her website http://www.wendypercival.co.uk.